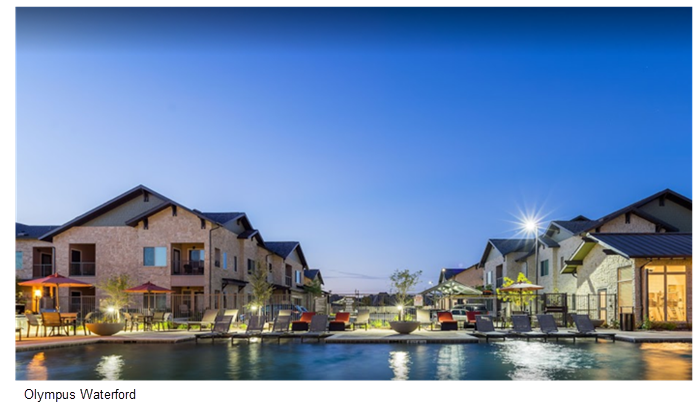 KELLER – A joint venture with ties to Dallas-Fort Worth has acquired three apartment communities. The properties will be known as Olympus Town Center, Olympus Waterford and Olympus Stone Glen. ​​The three communities in Keller that have been sold total 679 units throughout the three different communities. Keller is in close proximity of AllianceTexas, an 18,000-acre master-planned development that employs 44,000 people, and corporate campuses in nearby Westlake and Southlake. ​​Interested in more information? Check out DFW Multifamily Market Research!